I’m delighted to report that we can now buy locally grown kiwifruit at Hamilton Farmers’ Market. And it gets even better – it’s superb, certified organic green and gold kiwifruit, at a very good price. This is kiwifruit as it’s meant to taste. Try it and you’ll see what I mean. Peter and Dyan Downard, who are local organic sector veterans, are at the farmers’ market “until the kiwifruit is finished”. Most kiwifruit is harvested in May, so right now it’s prime kiwifruit season. Dyan says they’re really enjoying all the social contact with consumers. That’s a big disadvantage of exporting, she says – you never get to meet the people who enjoy eating the kiwifruit. I reckon organic kiwifruit are to be treasured, especially when they taste this good. The mainstream (non-organic) kiwifruit industry is founded on a whole raft of unsustainable practices and toxic chemicals, which are having far-reaching effects on the environment (including bees) and human health. Last year I interviewed Peter Downard for an article for Organic NZ magazine. 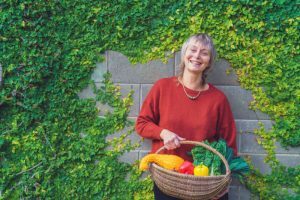 He has been in the horticulture business for well over four decades as a grower, teacher and consultant, and has been fully certified organic since the late 1990s. 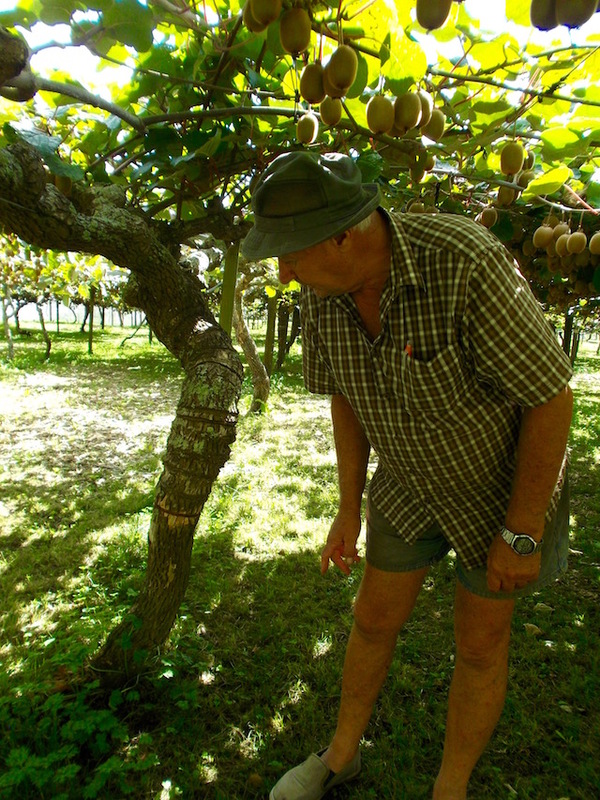 Peter Downard uses biological horticulture methods to look after the microbiology in his organic kiwifruit orchard. Peter explained to me that organic growing isn’t just about avoiding toxic sprays and replacing them with organic products. His system is founded on looking after the soil biology, to ensure the health of his kiwifruit vines and the quality of the fruit. People think of kiwifruit as a monoculture (and this is true of a mainstream kiwifruit orchard), but Peter’s organic orchard has 40-50 species of plants in the understorey beneath the vines. Not to mention the scores of beneficial micro-organisms and fungi in the soil. I don’t think kiwifruit needs any preparation. Neither does Dyan. You just scoop it out of the skin with a teaspoon. But if you want to be fancier, it combines well with other seasonal fruits in a salad, or a smoothie. As in the photo at the top of this post. Place in a bowl and mix gently. Add a dollop of plain yoghurt and a teaspoon of Sweetree honey drizzled over the top of each individual serving. This is one of the all-time classic combinations.